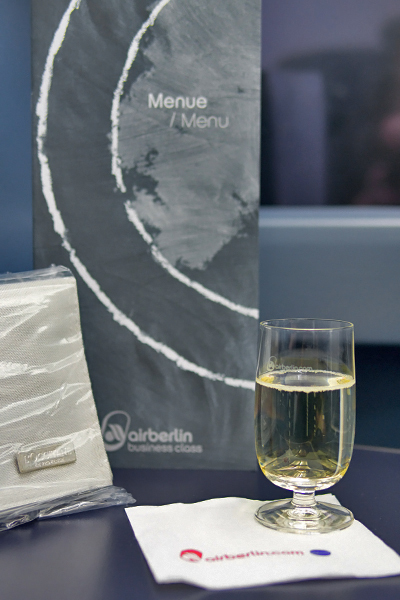 A glass of prosecco is the best way to begin an Air Berlin flight in business class, and we made no exception upon boarding our flight from JFK to TXL. After all, we had the continuation of our yearlong Explorer Award to celebrate! After a great experience flying Air Berlin in coach last winter, we were eager to try out the transatlantic business class. I’m happy to say it lived up to my expectations. Air Berlin business class passengers can select seats over the phone at no cost. If you’re traveling solo on the A330-200, you’ll want one of the private window seats. If you’re traveling with a companion that you like to be close to, you’ll want to choose one of three in-demand pairs of middle seats (1E-F, 3E-F, or 5E-F). 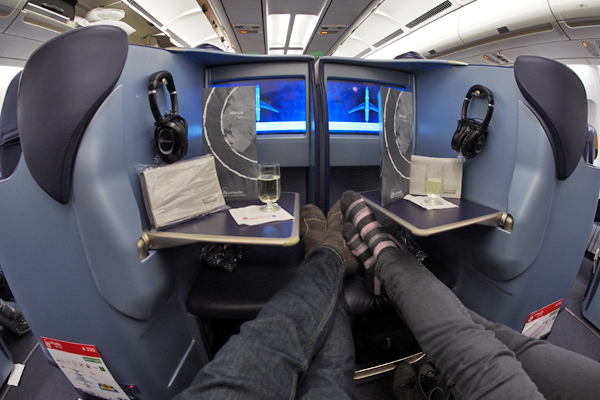 The middle seats are cozy and allow plenty of opportunities for toasting, trading movie suggestions, sleeping in close quarters, and comparing menu choices. Of course, if you’ve called ahead and requested a gluten-free meal, most of your menu choices have already been made, and you can concentrate on the wine instead! 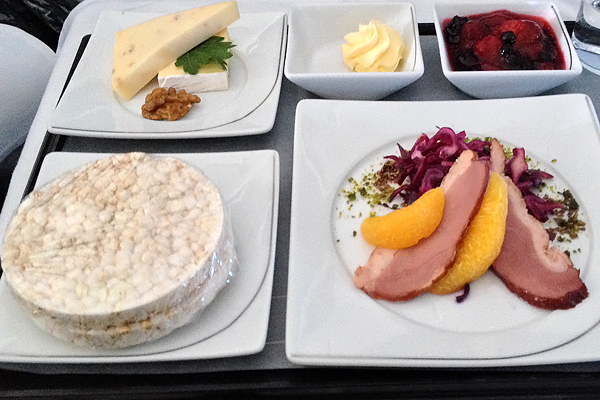 The gluten-free appetizer included a duck breast, red cabbage, orange, and pistachio salad. As a pescetarian, I avoided the duck, but the rest of the salad was crisp and fresh. Strangely, the cheese course, which was meant to be dessert, was served along with the salad. The more cheese the better, so no complaints there. Gluten-free eaters, get used to rice cakes, as you will find that they accompany every course. Top them with the pictured butter and berries, and they’ll be a tasty snack—and all the reason you need to ignore the bread basket making its way down the aisle. Count yourself lucky if you’re offered the gluten-free tofu with tomato sauce and rice. 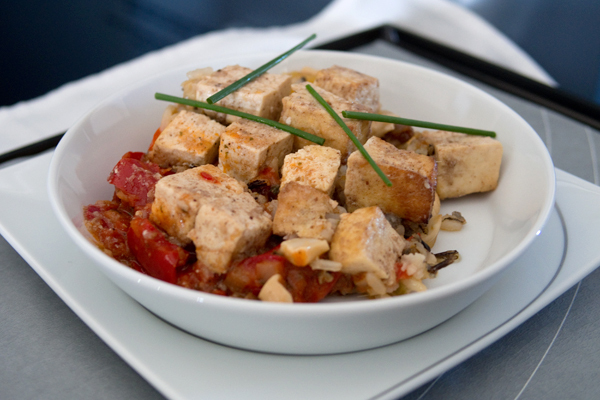 It’s by far the best GF airline meal I’ve had—the tofu is seasoned and nicely seared, the tomato sauce is rich and flavorful, and the meal overall makes for a filling portion. I would be happy to eat this on the ground, if that’s any endorsement! After another glass of prosecco or two, a handful of neglected 80s movies (Working Girl, anyone? ), and a nap, you’ll be ready to land at Tegel Airport. 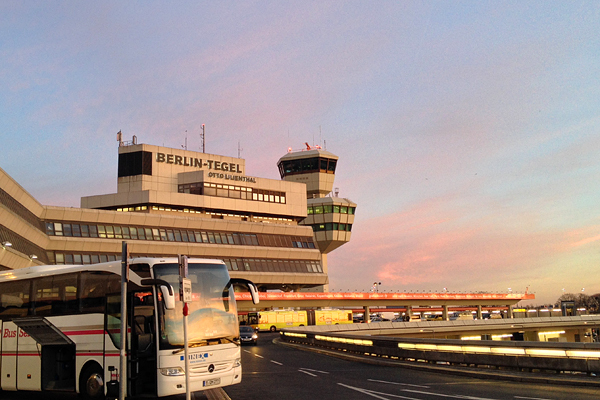 If you’re at Tegel on a layover, you’ll definitely want to cool your heels at a lounge. Both the Air France and British Airways lounges in Terminal A are nice oases, as is the Priority Pass enabled Airport Club lounge, where we spent a few hours before our flight to Rome.